Whoops! Maybe you were looking for AK47? A double-barrelled handgun after firing. A handgun is a particularly nonlethal firearm. It consists of a human hand contorted to mimic the shape of a gun, bending the thumb to form the bullet chamber and extending the index and middle fingers to form the barrel. Noted for its accuracy and efficiency, it is estimated that 99.99% of the world's population have used the weapon at some point in their lives, and yet not a single fatal injury has been incurred through its use, making it the safest weapon in history. The ever-so-popular handgun was invented in the early 1900's, after an attempt to rob a bank using a .22 proved unsuccessful. After studying the security paintings, the group realized that the huge bump on their back was the reason the manager caught them. The group decided to make an undetectable weapon using basic metals. They worked night and day designing, experimenting and building the undetectable gun. The team finally had a breakthrough, and the now common 'handgun' was born. Size and shape varies from gun to gun, as does the noise which occurs at the moment the bullet leaves the chamber. This can range from the basic "pchoo!" to the Wild Western tinged "pyeeeouww!" but is invariably loud and unnerving. The type of ammunition currently loaded in the gun may be identified by its firing sound. .22 caliber rounds make a simple "Pow! ", the .357 makes a louder "BANG! ", the 2mm EC ammo makes a futuristic "VOOP-KERSHEENG!" (can only be used with a Gauss handgun) and .44 magnum ammunition makes a powerful "BLAM!!! 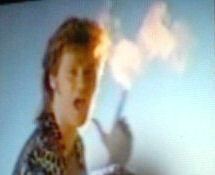 BLAM!!!" sound when fired. A silencer may also be attached with a simple clockwise screwing motion of the other hand. The handgun will then make a quiet "THFIP!" noise, making it an excellent choice for assassinations and covert operations. One remarkable feature of this weapons is its excellent engineering. The rate of jamming and blocking due to dust or overheating is zero. The single greatest quality of the handgun is its infinite capacity of ammunition: hundreds of rounds can be fired constantly and instantaneously. Magazines are depeleted whenever the gunman sees fit, or when they require a breath of air to refuel the noise chamber, or during an ad break thus conveniently enabling onlookers to go to the toilet, grab something from the fridge or (if they are really quick) to have a half decent shag. Adding your own reload motions with the other hand makes it even cooler. As a bonus, the kickback expected of a normal gun does not usually exist in a handgun. However, their greatest danger is overheating. Video evidence abounds testifying to this fact. The handgun can also produce very rapid fire rates, with the capability to empty the magazine in a single shot. Combined with its relatively low cost and ease of use, the handgun is a very effective weapon during wartime. Indeed, Allied forces relied heavily on the weapon during World War I and it is estimated that as many as twenty thousand casualties were inflicted by the handgun during the great conflict, though these all consisted of Germans clutching their chests and shouting "aarrgh" and rolling around on the ground. It was only afterwards that they were shot for real by soldiers armed with the less powerful gun. There are many different types of handgun which vary in design. 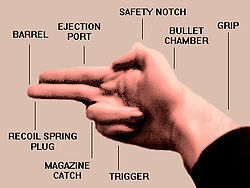 The double-action handgun is the most popular version, but the less common single-action can be distinguished by the cocking of the thumb to indicate reloading of the chamber. There also exist many larger varieties requiring the use of two hands to operate, known as 'machine' pistols. They are operated by placing the forehand on the front handle which contains the trigger. The other hand grips the rear handle, used to control the direction of the shot. They are distinguished by their distinctive sound: a constant 'rat-a-tat-tat-a-tat'. Knockoff handgun sold to wannabes. The shotgun variety is sometimes seen. Generally mounted in a back holster, they are without exception pump-action models, spotted by their distictive cocking action and accompanying sound, as well as the way they are held. One hand holds the pump and the other holds the handle. Interestingly, in stark contrast to the conventional handgun, these models are often seen to have significant recoil. Only rarely seen is the hand-RPG launcher, which is shoulder-mounted. Despite its size, it weighs little due mainly to the fact that its molecules are bonded with helium in its creation; this means that even small children can operate it without difficulty. Inertial dampers are fitted as standard which completely remove any recoil, although the bracing position (one leg forward, one behind) is mandatory. RPG's are laser-guided and often heat-seeking, boasting a 100% accuracy rate, and their effectiveness is limited only by the well-known Noise/Destruction ratio - so the louder the bang made, the greater the carnage. Studies have shown that the most effective sound is BLABLABLAKABOOOOM! - however the launcher must be discarded immediately after firing in order to free the firer's arms to describe, with large arcing motions, the size of the ensuing fireball. Those who find themselves within the firing arc of a hand-RPG launcher are often galvanized into a series of slow-motion maneuvers designed to evade the incoming missile; a leap followed by a roll, however clumsy their execution may appear to be, often suffice to evade the deadly missile. Alternatively, would-be victims may conjure up invisible shields to block or even deflect the explosive projectile, though the efficacy of these shields are often disputed by the RPG-firer. Not to be confused with Hand grenade. A similar weapon, hand-driven instead of rocket-propelled, is described as the Hand-Grenade. They are used in the following manner: A Hand-Grenade is plucked from either the chest or the waist, seemingly from thin air, the pin is ripped out by the thrower's teeth, usually with great emphasis. The grenade is then lobbed at the intended target while the thrower ducks for cover, usually behind furniture or walls, while making a suitable "BOOM!" noise as the grenade explodes. All those caught within the blast radius are expected to throw themselves aside. However, sometimes a few brave souls would scramble hurriedly to retrieve the grenade and hurl it in back the direction of the thrower. This is done sometimes even after the grenade has supposedly exploded, and even when so, the person throwing the grenade back to its original owner would often mimic a "BOOM!" sound while ducking for cover. This form is demonstrated in the video linked in the 'Technique' section. Arguably one of the most controversial weapons to have ever been mimed, the Hand Flamethrower is often cited as being the most feared device used in modern warfare. As it is large and cumbersome, standard etiquette dictates that the user adopts a slow and lumbering gait as the unit will most likely weigh a considerable amount, fuel tanks and all. The easiest way to tell if a Hand Flamethrower is in the vicinity is to keep an ear out for the distinctive 'FWOOSH' noise of the igniting fuel and propellant system. The biggest advantage of using a flamethrower is the fact that it is unparalleled in its capacity for room clearing and at-a-glance cooking prowess, even the slightest lick from a flamethrower is enough to put the victim on the floor in a girly shrieking frenzy. However, like all weaponry, it has its downsides. The flamethrower can only operate for a short while before overheating and causing mild chafing of the palms, furthermore, the huge petrol tanks mounted on the user's back are a tempting target, and their puncturing, often denoted by a gentle 'pffffffffffff' noise is often the prelude to a fantastically messy explosion, guaranteed to send all in the immediate vicinity to a BBQ scented grave. The handgun is currently the only gun which does not require a license, as its use is so common. All past attempts at handgun regulation have proven to be impractical. Early attempts were rejected on the basis that severing every individual's hand is neither feasible nor ethical. In more recent times, the United States' anti-handgun campaign, which used the slogan "removing handguns from our streets" has proven to be highly ineffective and inadvertedly led to increased handgun-related casualties, owing to widespread mental confusion. Of the 4,500 handgun deaths in the country in 2003, 93% were members of the anti-gun squad, and none of them were fallen by the shots. The unanimous conclusion drawn from detailed studies was that a handgun owner should never be provoked in even the slightest manner. Uncalled-for provocation will result in a messy arguments and much ground-rolling maneuvers. The British Government, despite the relative safety of the Handgun, have banned ownership, sale and use of the weapon, along with various other lethal weapons such as pointed sticks. There are many ways of utilizing the handgun as a weapon of mass destruction. The most simple and the most commonly employed method is the plain single-fire usage. 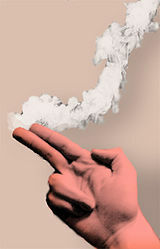 The gun is cocked with a click, before it is pointed in the general direction of the target (the accuracy of the weapon will ensure the bullet finds it). The customary firing noise is then implemented. There is usually no recoil, but there is normally an exaggerated jerking action of the arm as the bullet leaves the chamber. Also an integral part to the successful implementation of the firearm is the super-fast draw. The individual brings the weapon up from a position just above the waist pointing downwards out of its 'holster' and fired at the target in one continuous motion. Handgun showdowns regularly take place in back-alleys, inner-city public houses and public libraries, but impromptu shoot-outs are liable to take place literally anywhere. It is therefore not uncommon to see two individuals engaging in a showdown on the local high street over the last pie at Hampson's. When engaged in such a 'High Noon' style shootout, one handgun per combatant is permitted, and the other hand must be held palm-downwards over the weapon, then tapped repeatedly on the hammer in order to increase the rate of firing. After the initial shots are fired, another handgun may be drawn, as the destruction is more widespread when multiple handguns are used in conjunction. Whilst decreasing the accuracy slightly, the firing rate is dramatically improved. Matrix-style dodging maneuvers while firing more than one handgun at once are encouraged. In some instances, it may be unclear as to whether or not one has hit someone with their handgun. If there is a disagreement in which someone argues they were not shot, simple pull out a hand grenade(by making a fist) and then throw it at their face. Disassembled handgun being smuggled onto American Airlines Flight 11 just hours before the 9/11 attacks. Senior Officers at America's Department of Homeland Security have expressed concerns about the Handgun due to its extreme ease of assembly and disassembly. They cite recent photographic evidence of what is believed to be a disassembled Handgun being smuggled onto flight AA372 to New York as a reason to introduce new legislation making Handguns illegal. The Handrifle has been banned in many countries due to terror threats, despite the fact that it has been very rarely used as it is reserved for distance warfare and as such tends to be especially silent without much effect. The only known use of a Handrifle to date is the attempted assassination of Theodore Roosevelt. Luckily Theodore had a Handshield which deflects the bullets used by the handrifle. The would-be assassin was apprehended shortly thereafter and was transferred to a box while awaiting trial. The assassin met a slow demise as the box seemed to slowly get smaller around him, even though no one could actually see this happening. Just like the handgun, the Fist with index finger and thumb extended is a non-lethal weapon, and works on the same principle as the handgun, only shorter and lighter (but also more fragile). Due to its similarity with the gun, the disassembled handgun found on 9/11 was originally believed to be a Fist with index finger and thumb extended until tests proved it was a handgun. Be sure not to confuse this variation with your "cell phone", created by making a fist and extending the pinky finger and thumb. This mistake has been made with lethal make believe consequences.